Martha’s Task in Bartlesville will benefit from a weekend breakfast recently held at Masonic Lodge 284. Executive Director Laura Walton with Marth’s Task says they should be getting 27-hundred dollars from the breakfast held last Saturday. Walton says they won’t know the full amount until the Masonic Lodge gets the funds deposited and get the matching funds back. Since the year 2000 Martha’s Task has provided aid to women living in poverty. Between the two programs at Martha's Task, Walton says they serve about 80 to 90 women a year. The emergency assistance program where women come in for a few hours is one of those two programs. The other program is their seamstress training program. Walton says the money raised for Martha’s Task on Saturday will go towards their general operations fund. That will help pay for the wages of the seamstresses at Martha’s Task. She would go on to say that the money will also help with transportation funds for women who depend on City Ride to get around Bartlesville especially when conditions are bad. Life transformation is what Walton and her staff aim for at Martha's Task. She says low-income women come out of tough situations like drug court, domestic abuse or the homeless shelter when they come to Martha's Task. 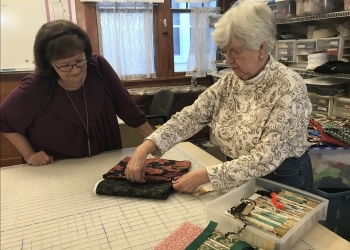 When those women come to Martha's Task, however, Walton says they realize the therapy of art as they develop key seamstress skills while making some cash on the side. Executive Director Laura Walton says they will always accept cash, fabric or supply donations like threads and scissors. You can also volunteer for the emergency assistance program to develop crafts and be with women living in poverty in the area. She says you can also help by driving women to special events as part of their transportation effort. Martha's Task is located at 718 S. Johnstone Ave. You can also give them a call at 918.336.8275.